I've read various questions and answers and I'm really struggling to setup up a Project/Sprint/Story/SubTask to get what we think we need. In terms of long term planning I've sold my team on the idea of Stories, estimates in Story Points, then measuring Velocity in Story Points. The stories, however, can easily be quite big; taking a week or more to complete. This is because a lot of the work is essentially "Research something, then document it and output some options and recommendations (with relative merits, etc)". That nicely fits with a break-down into various sub-tasks; different topics to research being separate sub-tasks, documentation of each topic also being separate sub-tasks, final options and recommendations being another sub-task. Use a Burn-Down chart to track progress, the target being 0 hours remaining by the end of the sprint? So far we have the Stories estimated in Story Points, and the configuration below for Time Tracking. So first to answer your simple question: Why not set the initial time as a function of the story points of the task? Story points are meant to measure complexity, which often ends up matching somewhat with time. That will give you a comparable result sprint after sprint. However in my experience as a consultant I found that you want to do as little manual tracking as possible. So instead of doing manual tracking to reflect on some board, focus more on the standup. The standup is supposed to be a mini sprint planning. A look at whether the current direction is going to take us to the sprint goal. So in that it makes sense to ask people if they're stuck(the classic "any impediments"-question). A subtask staying in the same status for a "long" time will be a very clear indicator that someone is stuck. Where we're becoming stuck is that a burn-down chart in story points is next to useless for us. So, we read about using Story Points for estimation and then adding time-tracking. In the Create Sub-Task dialog you should see a field named 'Estimate'. Here you can enter your initial time estimate in hours for each sub-task. If you don't see the 'Estimate' field, you may be able to turn it on by clicking on the 'Configure Fields' dropdown at the top right corner. 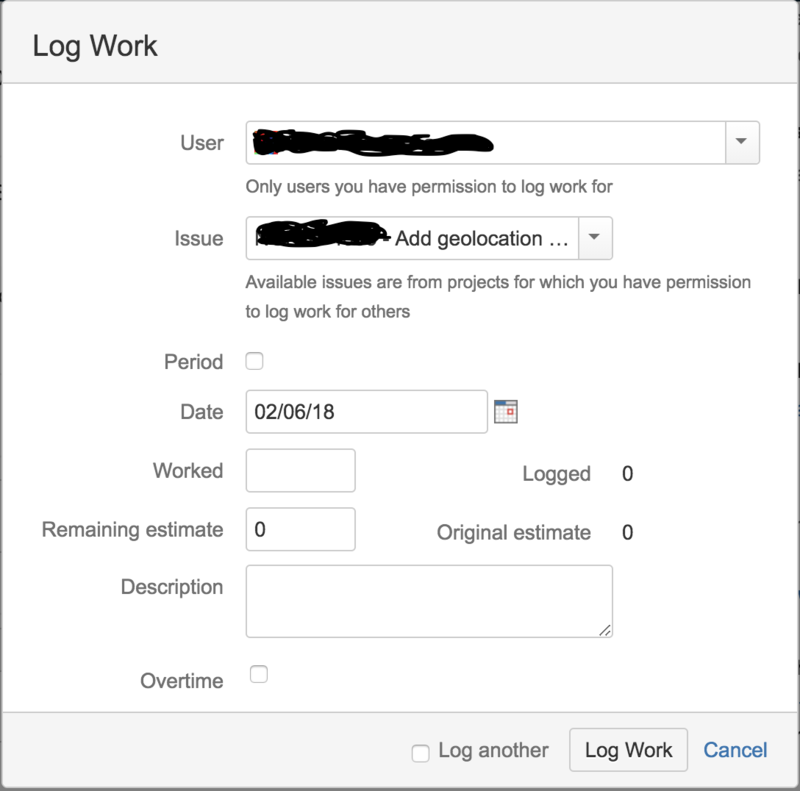 Once the Sprint starts, ask team members to enter the number of hours they 'Worked' on each task and the 'Remaining estimate' (regardless of the original estimate) in the Log Work dialog (see screenshot) for each Sub-Task. Go To Reports, click on 'Switch Report' and select 'Burndown Chart'. Select 'Original Time Estimate' for the vertical scale. Now you should see a Burndown chart in hours, using the Original Time Estimate as the baseline. Take a look at my related answer, here: https://pm.stackexchange.com/a/20367/25606. "The stories, however, can easily be quite big"
To me, the obvious solution is to break up your current 'Stories' ("Research this big thing") into multiple Stories (one per research topic). That way, your burn-down will be more consistent. I'm reluctant to break a story down in to smaller stories where those fake stories offer no business value in themselves [...] What we want here is information on how this sprint is progressing. Acting as an early warning to a failure to deliver. A fair point. In that case, however, if all you need is insight into the status of the Sprint, I question the need for the overhead of dual-estimation. Many Teams choose to estimate merely by number of Stories, rather than Story Points. Have you considered doing the same here, for SubTasks? Simply burn down the number of SubTasks, rather than their estimation. Provided your SubTasks have a relatively even distribution, this should work well. Not the answer you're looking for? Browse other questions tagged jira time-management story-points or ask your own question.